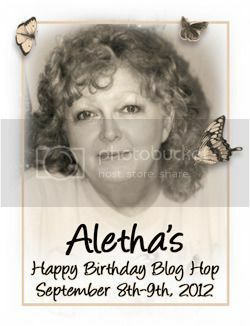 I received an email a week or so ago asking if I wanted to be part of a surprise blog hop for Aletha Williams' birthday, Sept. 9. Well heck yeah! Aletha is the immensely talented lady who's not only asked me to be on one of her design teams but now two. Heck yeah! Before I get into this, here's the Lady of Honor as well as the blogs on the hop. You should have arrived here from Susan's fab space. If you didn't, you may want to start back at Kristy's, the organizer of this whole celebration. So. A birthday card for Aletha. I felt like a traitor for this one- one of the teams I'm on is Aletha's ippity DT. I didn't really use ippity. I have the Mixed Bunch Stampin' Up set I've been looking for an excuse to ink. I even have the matching punch that I've been wanting to try out. So Aletha, while I didn't use MUCH ippity (the leaves! I didn't totally disgrace myself- I used ippity leaves! ), I broke out brand new supplies just for you! :) I wanted to make a fairly clean card with a purple flower on it, maybe a bit of ribbon. But WAIT! Based on a short conversation we had last week, I deduced (just call me Sherlock!) that Aletha likes to read... BOOKS. Actual paper books! Wouldn't a bookmark be nice?! So. You'll notice that the flower looks like it bulges a bit strangely off the page and, well, it does. That's because a polite little pull (well, maybe a firm twist and tug) should release the glue dot from the ribbon, allowing the ribbon and flower to come off the card and be used as a bookmark. I tied a ribbon slide to the end to keep the ribbon from fraying and to add a bit of weight to the far end. That's about the end of my grand ideas for the week! LOL. Before you move onto Sandy's, we have a gift for all of our hoppers! Tracey Malnofski, a fabulous Unity artista and owner/designer at The Stamping Boutique, has given us this digi to share with you for free because it's one of Aletha's favorite TSB images and is appropriately names "Fairy Aletha." 9/15/12: SORRY. The free image was removed after the hop. Please see TSB if you'd like to purchase the image. Thanks for joining us on the hop and don't forget to stop by Aletha's, the last stop, and wish her a very happy birthday! Jen, beautiful card and great idea with the bookmark! This is beautiful and so thoughtful, Jen! Each blog is making me more speechless as I hop along! Thanks so much Friend! I am so enjoying this. My weekend has been made wonderful! Love you! Great card and love the bookmark. Wow, this is lovely and I love the bookmark idea. TFS. So pretty. Love the CAS look. What a delightful card, and so thoughtful. I love the colors you used also. Thank you for sharing with us. Stunning Card Beautiful Flower Love the Purple Too ..
Beautiful! Lovely use of lilac! Thank you for joining Craft Your Passion this week! Oh this is so amazing! I love the the gorgeous flower! Thanks for taking part in DYSU. Wow! !this is beautiful! !Thanks for joining us at DYSU this week. Love the soft purples! It's so pretty. Thanks for playing along with us at the Stampendous Saturday Challenge. Lovely card, thanks for playing with the Stampendous Saturday Challenge. Good luck! Gorgeous! Love how the embellishment becomes a bookmark! Thanks for playing along with Stampendous Embossing Challenge!